- x3 HDMI, x3 USB: Connect your consoles, blu-ray and streaming boxes. Play media from your USB device. - Need a wall mount or stand? 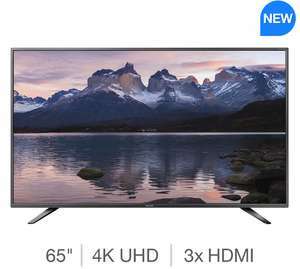 The UHD 4K Smart LC-65CUG8052K has it all: slim design, exceptional picture quality, room filling sound by Harman/Kardon® and great connectivity. These TVs sport integrated digital tuners, built-in Wi-Fi, three HDMI 2.0 and three USB ports one being 3.0. With ACE PRO ULTRA picture processing and Active Motion 400 you will enjoy the best UHD picture quality. The high quality speaker system by Harman/Kardon® completes the cinematic experience by delivering room filling sound. Wirelessly connect your PC or Android device to your TV and immediately send media files to the big screen. It’s a great way to enjoy photos and videos together with friends and family. This powerful image optimisation technology analyses and enhances incoming video signals for accurate colour reproduction, improved sharpness and reduced noise. The result is a crisp, yet natural picture. By using radio frequency technology instead of the usual infrared for transmission, your remote control works every time. You don’t have to aim it at the TV, just push a button. Wired smartphone connection with your TV including mobile phone battery charging. With this newest video codec your TV is ready for the new broadcasting standards. Aluminium is a durable, yet elegant material that enhances the modern elegance of SHARP AQUOS LED TVs. DTS creates virtual surround sound for a cinematic audio experience. Together with the built-in Harman/Kardon speaker system you will enjoy immersive sound right out of the box – no extra hardware needed. Bugger you beat me to it had a look at its £930 on ebuyer. What's the length of warranty?? That's because Sharp isn't the company making or selling this TV in the UK. 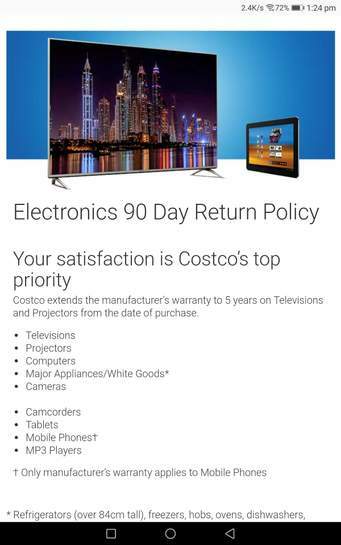 TV now reduced to 649.99 inc VAT and delivery in latest Costco leaflet.